New online tools aim to save endangered animals, but experts say there are no easy shortcuts. 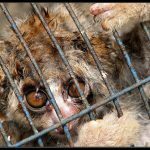 A recent raid on an online trader in Indonesia rescued 19 endangered Javan slow lorises. “That’s just a tiny tiny snapshot of the true scale of online wildlife trade,” says Tania McCrea-Steele, who leads IFAW’s global wildlife cybercrime project. “Multiply that by all the countries of the world, over 190 countries, and you can imagine the trade is huge.” So huge, in fact, that it generates about $19 billion in revenue each year, according to the same report.